Giancarlo Stanton of the Marlins led all players in home runs in 2017 and ranked second among all batters in Box-Toppers points for the season. 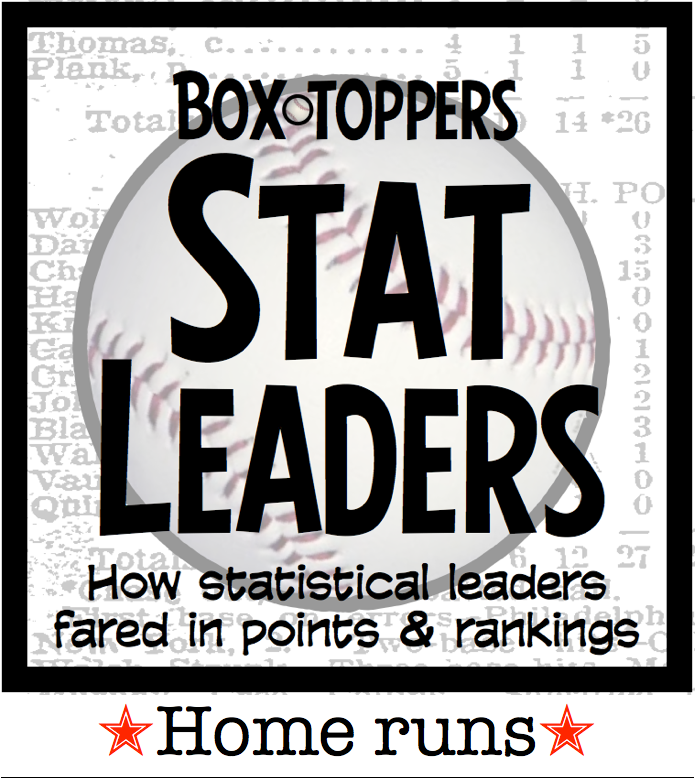 Here is how 2017 win (HR) leaders fared in Box-Toppers points. Players are listed by most home runs. Also shown are their 2017 Box-Toppers points (BTP) and their rank in Box-Toppers points among all players. Stanton hit 59 home runs in 2017 and earned 14.2 Box-Toppers points, behind only Anthony Rizzo of the Cubs (15.5). Since 2012, only three other batters, including Rizzo in 2017, have had a higher single-season Box-Toppers point total than Stanton’s 14.2 this season. Stanton ranked 17th among all players in Box-Toppers points in 2017, second among National League batters behind Rizzo. Aaron Judge of the Yankees led American League players in 2017 with 52 home runs, second behind Stanton. Judge earned 11.2 Box-Toppers points in 2017, 26th among all players and second among AL batters, behind Edwin Encarnacion of the Indians (12.1). Judge and Stanton will be Yankees teammates in 2018 after Stanton was traded in the offseason from the Marlins. Cody Bellinger of the Dodgers, who ranks tied for sixth with 39 home runs. Bellinger had 8.7 Box-Toppers points in 2017, 64th overall and 10th among NL batters. Encarnacion of the Indians, who ranks tied for eighth with 38 home runs. Encarnacion had 12.1 Box-Toppers points in 2017, 22nd overall and first among AL batters. Khris Davis of the Athletics who ranks fourth with 43 homers. Davis earned 4.5 Box-Toppers points in 2017, 224th among all players and 56th among AL batters. Davis is Box-Toppers’ lowest-ranked player among the top 10 in home runs for 2017. Joey Gallo of the Rangers who ranks fifth with 41 homers. Gallo earned 6.5 Box-Toppers points in 2017, 122nd among all players and 27th among AL batters. Nelson Cruz of the Mariners who ranks tied for sixth with 39 homers. Cruz earned 5.5 Box-Toppers points in 2017, 167th among all players and 38th among AL batters. Mike Moustakas of the Royals who ranks tied for eighth with 38 homers. Moustakas earned 5.0 Box-Toppers points in 2017, 206th among all players and 53rd among AL batters. Logan Morrison of the Rays who ranks tied for eighth with 38 homers. Morrison earned 6.7 Box-Toppers points in 2017, 114th among all players and 22nd among AL batters. Justin Smoak of the Blue Jays who ranks tied for eighth with 38 homers. Smoak earned 6.5 Box-Toppers points in 2017, 118th among all players and 25th among AL batters. Though Khris Davis ranked fourth in home runs, he ranked lowest in Box-Toppers points among the top 10 home run hitters—with just 4.5 points, he ranked 224th among all players. Why did he rank so low? Davis played in 153 games and hit homers in 39 of them. The Athletics won 70 games he played in and he hit homers in 20 of those games. He was Box-Toppers Player of the Game in just four of those games. However, each time he earned Player of the Game honors, he did it hitting at least one home run. Two of the times he earned Player of the Game honors, he hit two homers in a game—April 3 (earning AL Batter of the Day honors worth 1.5 total Box-Toppers points) and Aug. 25. By contrast, Giancarlo Stanton, who led all players in home runs, had 14.2 Box-Toppers points. Stanton played in 159 games and 76 Marlins wins. He hit his 59 home runs in 49 games and the Marlins were 33-16 when he hit at least one homer. Stanton was Box-Toppers Player of the Game 11 times in 2017 and he hit at least one home run in each of those games. Stanton hit two home runs in a game 10 times in 2017 and was Player of the Game in four of those. Miguel Cabrera of the Tigers, who had 16.9 Box-Toppers points in 2013. Jose Abreu of the White Sox, who had 15.5 Box-Toppers points in 2014. Anthony Rizzo of the Cubs, who had 15.5 Box-Toppers points in 2017.